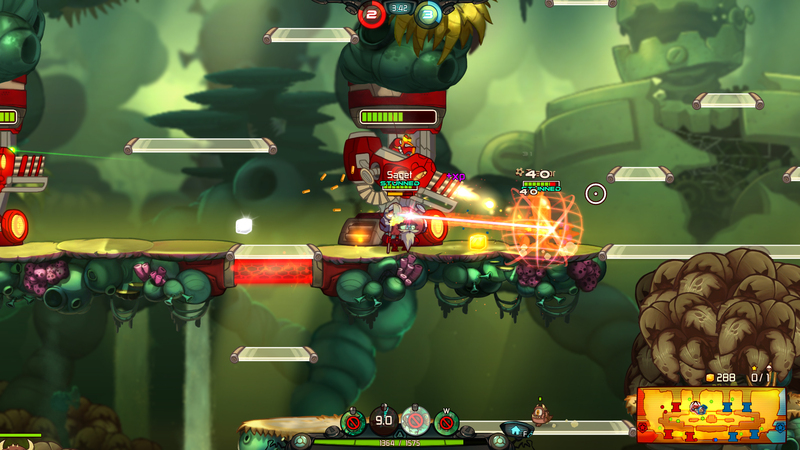 Awesomenauts: Overdrive is a new expansion for Awesomenauts that has been released March 3rd 2016. 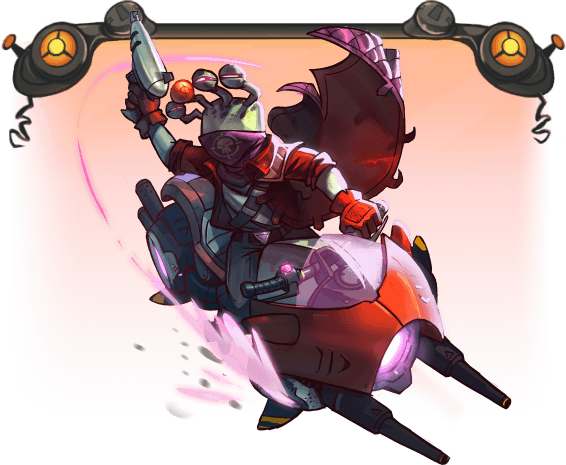 Overdrive adds three technologically-advanced characters to the playable roster: the time travelling old timer Professor Milton Yoolip, the bike riding bounty hunter Chucho Krokk and the armored baby Jimmy or Amy & the Lux 5000. For more details on these characters, scroll further! 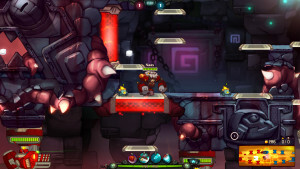 The premium characters can be bought here on the site or on Steam (requires Steam to be installed on your system). 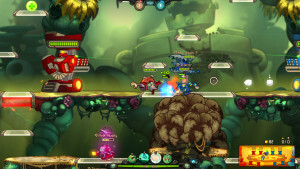 All the other components mentioned will be free for all owners of Awesomenauts! The Overdrive Expansion has a paid add-on that brings three awesome new characters to the game. As a scientist professor Milton Yoolip loves to create wondrous inventions and contraptions like the dog aura reader, nightmare-to-VHS recorder, the random number phone, cereal-to-milk-ratio calculator and an actual time machine. One day after combining the time machine into some comfy slippers, he teleported to the Mesozoic era and got stuck with the dinosaurs after losing one of his teleportation slippers. He spent years to craft a new slipper to travel forward in time to return to his beloved granddaughter Ayla. 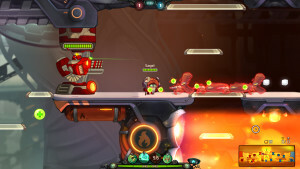 He joined the Awesomenauts team to finally spend some quality time with her and eat some over-engineered pancakes. Jimmy, Amy and the Lux-5000 Toddletron are a mighty team. They have won numerous fights in robobrawls held in the many arenas and slums of Circuit City on Calias. 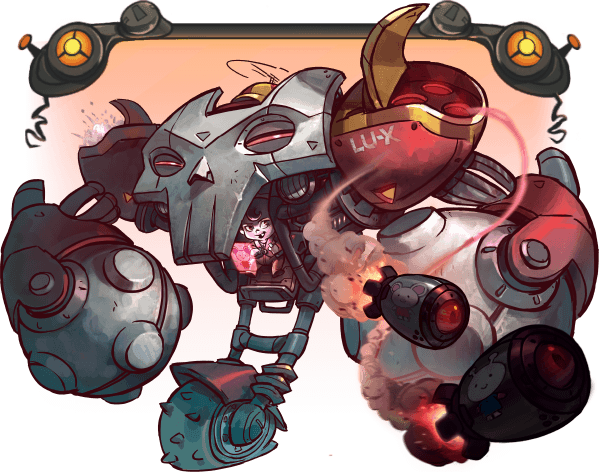 The twins love to crush enemies and cause mayhem with the Toddletron's metal wrecking balls, which are basically two big rattles from their perspective. After each won fight Jimmy and Amy share a bottle of the finest Bovinian milk and watch cartoons before nap-time. 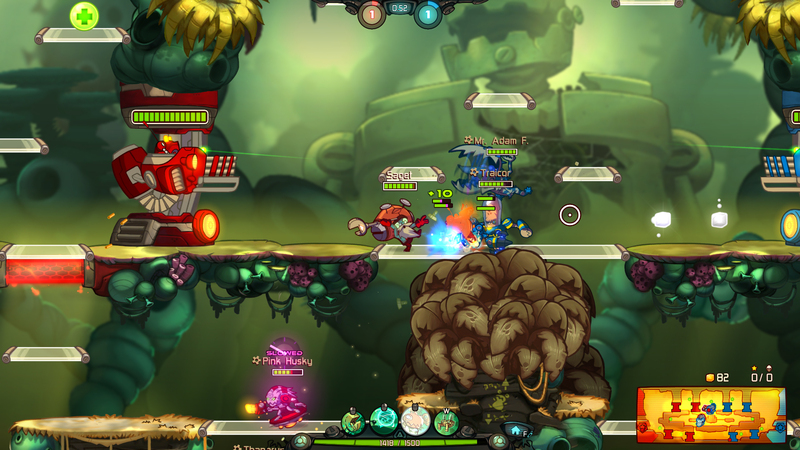 Being big fans of the Awesomenauts they skipped the seasonal diaper league tournament and joined the team for some grown up fights. 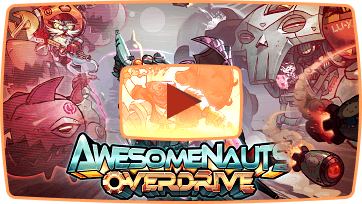 New matchmaking is coming to Awesomenauts during the Overdrive! The addition of this new system will result in more evenly balanced matches and improved connection stability. The new matchmaker will test the players' connections amongst each other instead of relying on distance to determine the best setup. Also, by accumulating a large group of players first and then matching them instead of working on a first come first serve basis this system will create better matchups. Finally, matches will only start full, latejoining will be removed from the game, and disconnected players will be able to rejoin their match. During the Overdrive, a lot of visuals will be overhauled. UI, character art, special effects and many other aspects of the game will receive an extra large dose of some good old tender love and care. Perhaps the best example of this ongoing visual evolution is Sheriff Lonestar's brand new attire! Yeehaw! The massive Starstorm station is almost ready for battle. 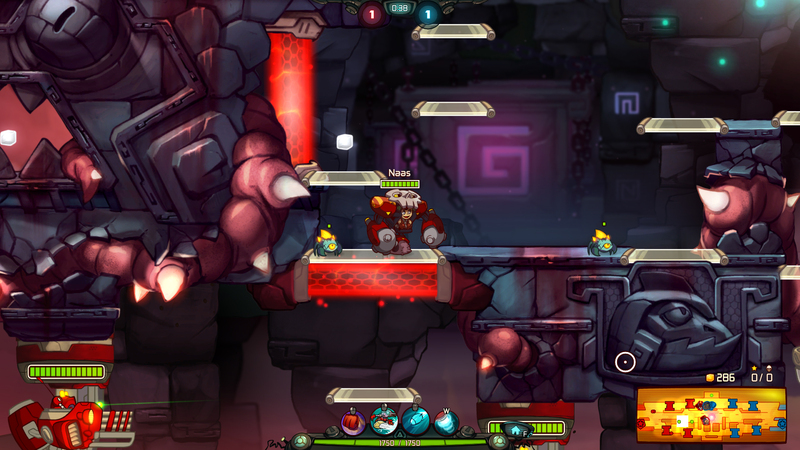 This level is playable for everyone right now in it's pre-alpha development stage in custom matches. On this map there's two big new factors to keep in mind, warpholes and bottomless space! 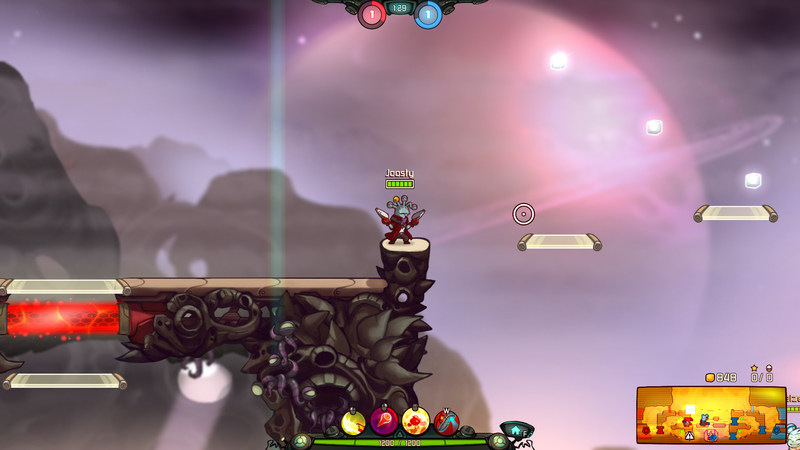 Leaping into one of these wormholes will conveniently teleport you to the top of the map. Bottomless space is less convenient however, it actually kills Awesomenauts who jump into it. The Starstorm map is expected to be out somewhere early 2016! 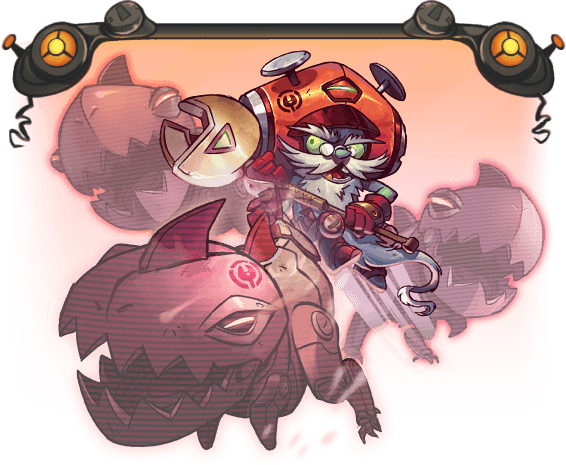 The winning character from the Design-Your-Naut 2 contest held last fall, Ix will soon be joining the Awesomenauts. 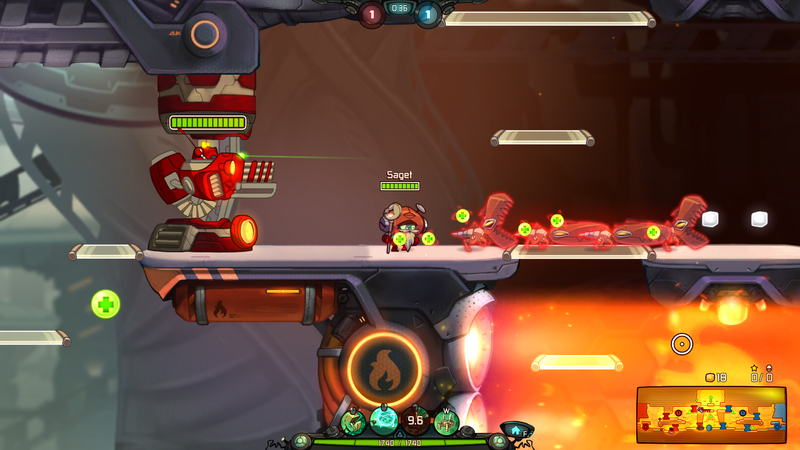 Ix can attach a link to other Awesomenauts, friend or foe. Once attached he'll either heal or damage the 'Naut on the other end. 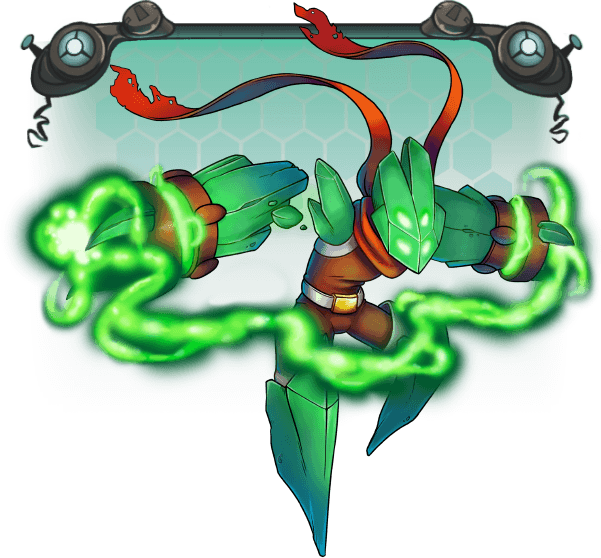 His secondary skill lets him become damage immune for a short moment. When linked to another Awesomenaut however, it lets him swap positions with the linked 'Naut. This opens up lots of interesting gameplay possibilities! Ix the Interloper will be free for all Awesomenauts owners when he releases somewhere early 2016.